house update // living room chairs! My living room is NEARLY done! About a week ago I received my two swivel chairs, and it finally feels as if the room is complete! I still have a few little knick knacks to get for the coffee table and buffet under the mirror, but all the big furniture is here and it feels soooo good to be done with that. The reason these chairs took so long? The fabric was on backorder. I totally understand why though! The color, pattern and raised velvet looks so luxe. It looks absolutely perfect in this particular space too, as it pulls the teal from my rug and complements the couch fabric without competing with it. The result is an inviting, serene living room with a glamorous touch… and I couldn’t be happier with it. I’ll be doing a full room reveal at some point soon, but in the meantime here are some pictures of my new chairs! Before you head off into your Monday, I want to touch on a few things in this outfit too. 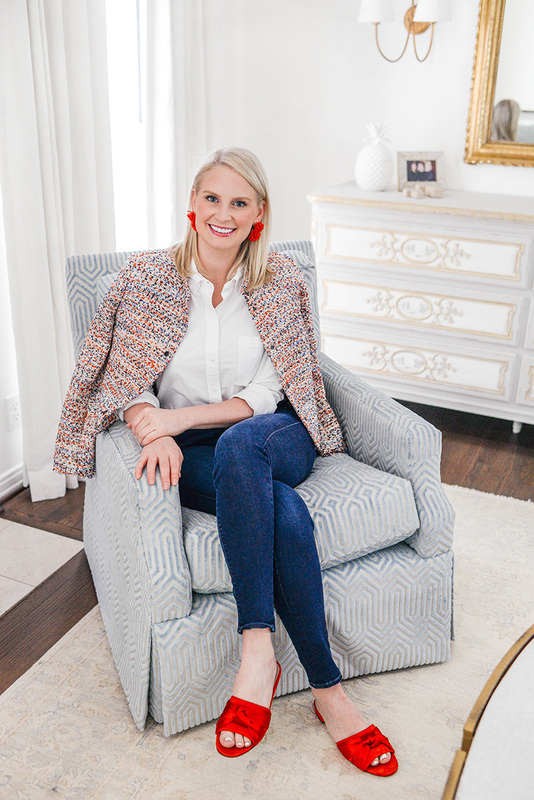 This tweed jacket is under $60 and such a fun, colorful addition to my spring wardrobe! It’s slightly cropped and runs really small, so I bought a size 8. Tweed is such an elegant, versatile fabric that is definitely appropriate for the office, but also elevates your favorite jeans looks. To pull out the red and orange thread in the jacket, I thought it would be fun to throw an extra pop of color by way of these new slides! I actually bought these shoes to pair with the bag I bought in Argentina, but they go with way more than I expected! As you guys know I mostly wear neutrals, but every once in awhile I like to jazz things up with a punch of bright colors… shoes are such an easy way to do that! 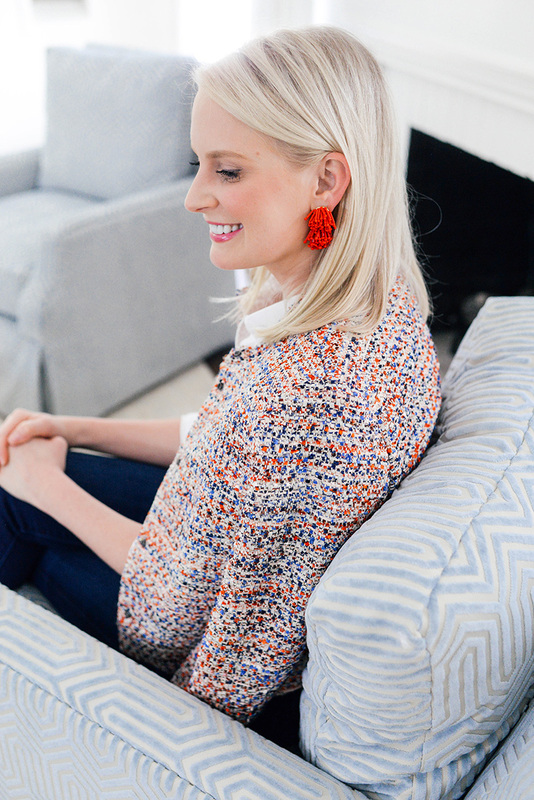 You’ll see another example of my pairings of brights with basics next week, so stay tuned. That is exciting about your living room! Such a good feeling! Hopefully you can share more about it soon! I’m such a big fan of red period for a person who is also addicted to neutrals, I find that the occasional pop of animal print or red makes me feel dressy and feminine. Love this look and I will definitely be purchasing the tweed jacket! Love the chairs and the overall color of the room. Your look is so pretty with the red! LOVE how they turned out!! !